Family-Friendly: - Minimum age of child is 5 Cot, High Chair available. 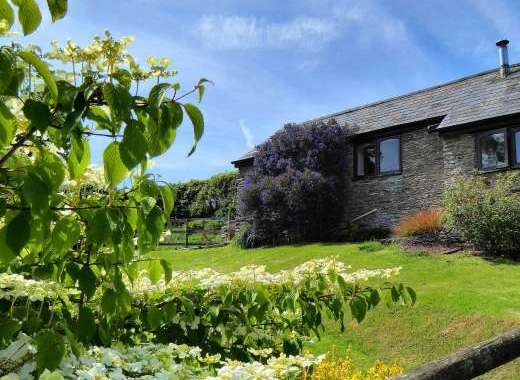 Contact Phil & Pam at Milk Wood Bach Log Cabin for 2 to 3 people on 01341 450248 or complete the enquiry form. This pretty one bedroom log cabin is a dream of a place to stay for a week in Snowdonia for two people (or three with a sofa bed). Spacious, warm and attractive with its own private enclosed back garden, garden furniture and a barbecue, this accommodation promises a brilliant start to any holiday. Each room is attractively furnished to provide holiday accommodation of a very high standard. The red of the sofas and rug in the sitting room complements the gold tones of the wooden interior. The whole effect is warm and welcoming. This is a living space where it is easy to relax and snuggle down to watch TV or listen to music. There is a log burner that guests are welcome to use to fill the room with its amber glow and flickering lights, which is especially welcome for holidays in chillier weather. One very nice feature of this log cabin is its two person sauna which would soon warm guests through to their bones. How nice would this be to use during the cooler times of year or winter with snow on the ground? The oak kitchen is nicely fitted and offers plenty of storage space, a double oven, hob and microwave for cooking and a big fridge/freezer for cold storage. There are all the essential domestic appliances including a dishwasher. You will find that this log cabin is kitted out to a very high standard to make holiday living pleasant. A dining table and chairs provide a comfortable place to sit and eat meals on holiday, alternatively, there is a table in the garden for those warm sunny days. A double bedroom and a sofa bed (in the dining area) for one allows for two or three people to stay (children must be over 5 years of age). The shower room contains a walk in shower and WC and also houses the laundry facilities. Do please survey the photographs for this log cabin holiday near Dolgellau in Snowdonia – we are sure that you will like what you see. Please let us know the number of adults and children staying, plus details of any dogs' you would like to bring including breeds and age. If you are holidaying with babes in arms and need a cot, please let us know in advance. We Welcome Dogs over 1 year of age that are fully house trained, however please note that we are unable to accept large dogs or dogs that moult heavily. Please note that dogs are not permitted in bedrooms and that a dog charge of between £20 to £40 per dog applies. Weekly lettings and short breaks of 3 or 4 days are possible. Prices quoted are for 2 people, for additional guests, these are charged at £10 per night per person. For weekly bookings, bookings are from 4pm Friday to 10am Friday or from 4pm Monday to 10am Monday and the price range is from £560 to £812. 3 Night Short Weekend Breaks (from 4pm Friday to 10am Monday) are priced at £339 to £456, as are 3 Night MidWeek Breaks which are available from 4PM Monday to 10AM Thursday, or 4PM Tuesday to 10AM Friday. 4 Night Mid Week Breaks are priced from £360 to £560, and are 4PM Monday to 10AM Friday. We occasionally have special offers for midweek breaks available, which are advertised from time to time. Weekend 2-Day Mini Breaks are only available outside of school holiday periods, or if there is late availability, and are from 4pm Friday to 4pm Sunday or 10am Saturday to 10am Monday. These breaks are charged are priced from £314 to £380. Requests for bookings outside of the above will be considered but we may need to make additional charges to cover our extra costs. Our prices include linen, robes for your use during your holiday, indoor bath towels, use of the sauna, electricity & heating, Wi-Fi internet access and a maximum of one basket of logs for the wood burner per day. You are strongly advised to take out appropriate holiday insurance. Prices shown may vary or alter at the time of request. Own private Hot Tub and sauna unit. 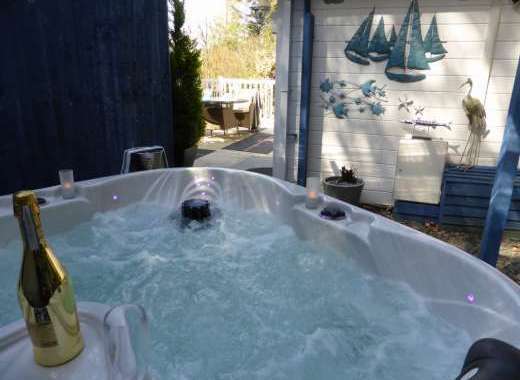 Enclosed Garden: A full enclosed and secluded garden with a Hot Tub on the decking. BBQ. Really pretty. There are simply too many attractions to list here, however in the Brithdir and Dolgellau area there are good opportunities for angling during your log cabin holiday if both you and your partner enjoy whiling away a few pleasant hours on a riverbank. There is a 13 mile stretch for angling on the rivers Mawddach and Wnion with plentiful trout and salmon. Llyn Cynwch is a good spot to fish for rainbow and brown trout, also fly fishing at Creggenan Lakes. The Afon Mawddach valley between the town of Dolgellau and the eastuary into Cardigan Bay, by Barmouth, is oustandingly beautiful and wildlife rich. A former disused railway track has been converted to a cycle route and is a very good way to take in the scenery. Hire bicycles or perhaps a tandem for two in Dolgellau and see if you can finish the 8 mile route and get to the sea. Go for a nature ramble and see if you can spot reclusive pine martens, otters or red squirrels. Recommended Places to Visit: Where is good to visit in south Snowdonia much depends on your own personal interests. Some people will be blissfully happy taking photographs of the mountainous scenery, others like to hike or investigate the pubs. Thankfully, there is literally something for everyone in Snowdonia. It would take the best part of a week to explore the lovely stretch of countryside between the holiday log cabin and the coast. Both Fairbourne and Barmouth on the coast have very good Blue Flag beaches. Recommended Places to Eat Out: We can recommend a list of restaurants on arrival that previous guests have liked. Local Sports: This part of Snowdonia is an outdoor haven and offers every kind of activity that includes hang gliding, canyoning, kayaking, plenty of fishing in rivers and lakes, horse riding, climbing and hiking, mountain biking, gorge walking.